Finally, a supplement stack focused on improving the in-game cognitive function of rugby players. Ruck Smarter has you covered. Our sponsorship program means your rugby club gets $4.60 when you buy Ruck Smarter. Find your club’s code. 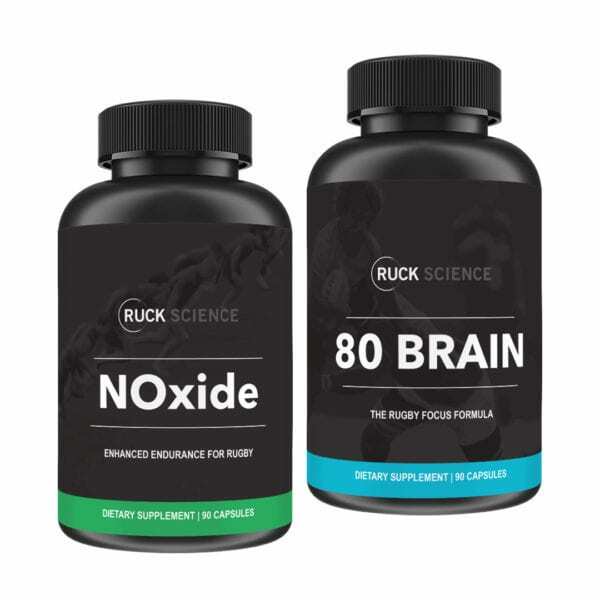 If you’re looking for a mental edge on the rugby field, Ruck Smarter might just be the perfect supplement stack for you. It combines our custom brain-supplement formula with an no2 booster whose ingredients have also been shown to have cognitive benefits. The natural ingredients contained in 80 Brain and NOxide have been shown in numerous studies to have a positive effect on functions like working memory, focus and cognitive performance. In this stack, we’ve combined what we believe to be a rugby player’s two best supplements for brain function. Rugby is one of the most physical sports out there. But it’s also a game that requires elite levels of concentration during exhaustive physical exertion. One way to improve your performance on the rugby field is simply to play harder, by taking supplements that will enhance your athletic performance. Another way is to play smarter and in the process, make your life easier on the field requiring less physical exertion for the same results. This means picking up calls, assessing dynamic situations and reacting faster to situational changes in the game. Who doesn’t want that? Please note: neither of these supplements is to be used in the treatment of concussion or mTBI. If you or a teammate have suffered a head injury, consult a physician and follow their instructions for returning to play. Really happy you guys changed this stack up to take out the pre-workout. I’m not a fan of caffeine so having these two together instead makes a lot of sense. Thanks.